Citi Field, the future home of the New York Mets, is scheduled to open its doors by Opening Day 2009 to coincide with the opening of the New York Yankees’ new stadium in the Bronx. 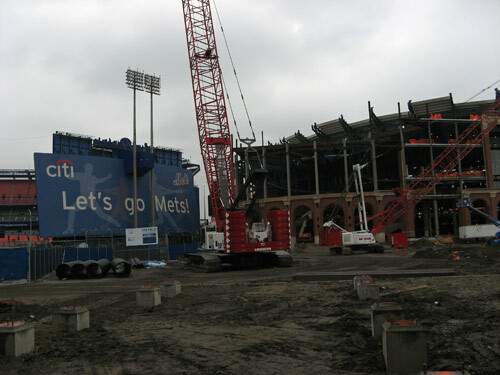 In March 2006, the Mets received approval for $632.1 million in bonds for construction of the new ballpark. (Corporate sponsor Citigroup will be paying $20 million a year over the next 20 years for the naming rights to the park.) 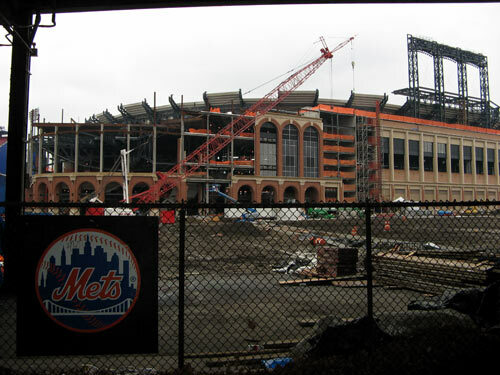 HOK Sports‘ plans were unveiled a month later, and on November 13, 2006, the Mets officially broke ground for their first new ballpark since 1964. The concrete arches and brick, limestone, granite and cast stone façade were inspired by Ebbets Field, home of the bygone Brooklyn Dodgers. I’ve been able to track the progress of the construction going on adjacent to Shea on my weekly rides out to Queens on the 7 train. This Saturday, avoiding the Chinese New Year parade madness in progress at Main Street, I got a closer look at the project from Willets Point. As of mid-February, about 85% of the stadium’s structural frame is complete. Mets pitchers and catchers report for duty on Valentines Day! There are no comments just yet.